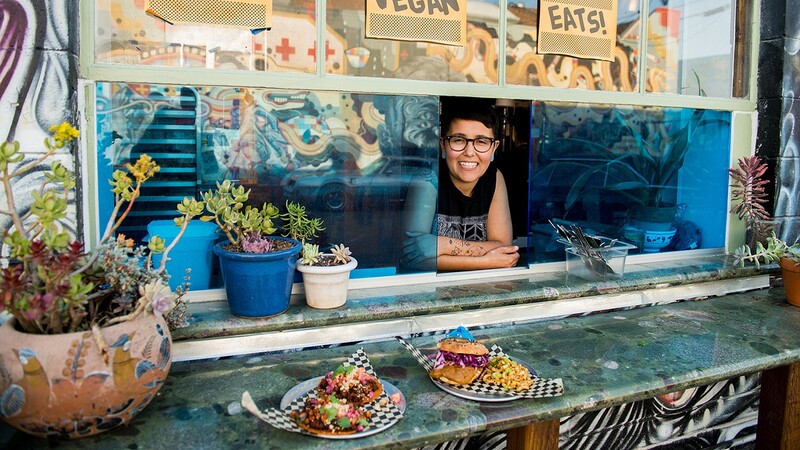 After nearly three years at Classic Cars West, Hella Vegan Eats, a trans-queer POC-owned restaurant, has been asked to leave at the end of February. "We just have different styles and different values, and honestly it just hasn't been working out, even though it's been almost three years," said Silvi Peligras, who co-owns Hella Vegan Eats along with Tiff Esquivel. "It just gets to a point where you realize you're not gonna be able to work together anymore," said Michael Sarcona, owner of Classic Cars West. Starting March 1, Sarcona will serve a new vegan menu with items like Impossible burgers, vegan sausage, salads, soups, and Creole-inspired fare. There'll also be vegan coconut gelato made in-house by Kokolato. Hella Vegan Eats began about a decade ago when Peligras and Esquivel started selling vegan tamales at Oakland's Art Murmur. Today, the restaurant is best known for its comfort vegan food, with lunch and dinner options like the potsticker burrito and cauliflower tacos, and brunch dishes like chicken and waffles and chilaquiles. It served food in the beer garden at Classic Cars West, while the latter ran the car showroom, art gallery, and beer garden. Despite cooking and serving food in that space, however, Hella Vegan Eats did not have a formal lease. "We've invested a lot financially and also emotionally, but we're not protected under a lease at all," Peligras said. Peligras said the restaurant hopes to find a new brick-and-mortar location in Oakland. "We're Oakland people," Peligras said. "Oakland's very much embedded in my DNA, personally. It's helped me become who I am." Although Hella Vegan Eats formerly operated out of a food truck, Peligras said they don't plan to return to the food truck model. Peligras and Esquivel are also working to support their staff of about nine employees. The restaurant started a GoFundMe page to help cover relocation costs and to provide their employees with supplemental income beyond what unemployment benefits can offer. After just two days, the restaurant had raised over $8,000 of its $10,000 goal. Peligras said the restaurant is trying to relocate as soon as possible, but "it's just been really difficult to find space here in Oakland." In the meantime, the displacement will be a major loss for the communities who love Hella Vegan Eats. "All of the weirdos, the queers, the freaks, the trans people, the people of color who come support us because we're people of color, all the freaky vegans who dine with us who are down for radical politics and our wacky clown ways — we're a home base for so many of these people who come and eat with us all the time," Peligras said.